Click above 2 C Pics! Both Don and I received some classic phone calls from Johnny Stevenson of Rhinocerotic. It seems that Timmy Wolf's nephew may be learning some Rhino tunes. Not a lot of info yet on this one but it is an interesting turn of events. Maybe a couple new songs?.. Don't know yet but I've just released Glamorous Star and the Rhinocerotic black album digitally only on CDBaby if there is a demand we will get it out on other sites as well. 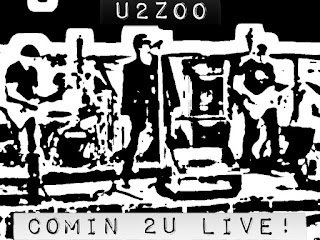 Back to U2Zoo. We performed our first full show with Don (my first huge show, 29 songs) at the Brass Tap for their Tap-Toberfest event. Great crowd, friendly, and knowledgeable on their U2 songs! Did I mention super responsive... When I'm singing '40' they are coming right back at me. Awesomeness! Don and I were both saying what a great crowd dude... We hit deep with some 'Spanish Eyes', 'One Tree Hill', and the most dangerous 'Bad' along with 'The Unforgetable Fire', and 'A Sort of Homecoming'. Definitely going old school in the new vibe for U2Zoo. We will be heavily focused on the earlier era of the band. It's sounding promising at practice. Stay tuned for what happen next!